2. What does that have to do with Shavuot? 3. What does Shavuot mean for contemporary Jews? 4. What does Pentecost mean for contemporary Christians? 5. I like gifts. What did you get me for Pentecost and Shavuot? Sorry, neither Christians nor Jews exchange presents on Pentecost or Shavuot. Nor do they eat cake. Some Jews mark Shavuot by decorating their homes with spring flowers; others stay up during the first night of the festival — this year from sundown on Saturday to sundown on Monday — to read the Torah. They go to synagogue, where the Ten Commandments — the foundational laws they believe were given to Moses on Sinai — are read aloud. Christians generally mark Pentecost by a reading from Acts, and some wear all white, or all red. 6. What is another name for Pentecost? In medieval Britain, Pentecost was sometimes called “White Sunday” — or Whitsunday — for the custom of wearing white. With this in mind, Pentecost is closely connected to the celebration of Easter and the coming of the Holy Spirit is emphasized in relation to the Sacrament of Baptism." 7. Where can I read about Pentecost in the Bible? You can find the story of the original Pentecost in Acts 2. You can also watch this narrated video of the incredible Pentecost story. If you've never been one to celebrate Pentecost Sunday, this powerful version of Acts 2:1-4 will put it into a whole NEW light for you. 8. Where can I read about Shavuot in the Bible? Since Shavuot commemorates God's giving of the Torah, or the law of God, to Moses and the Israelites, you can read about it in much of the Bible. Specifically, the Torah refers to the first five books of the Bible--Genesis, Exodux, Leviticus, Numbers, and Deuteronomy--which contain the details of the laws God gave to His people, including the 10 Commandments in Exodus 20. Also, as was previously mentioned, Shavuot is sometimes associated with the Book of Ruth in the Old Testament. 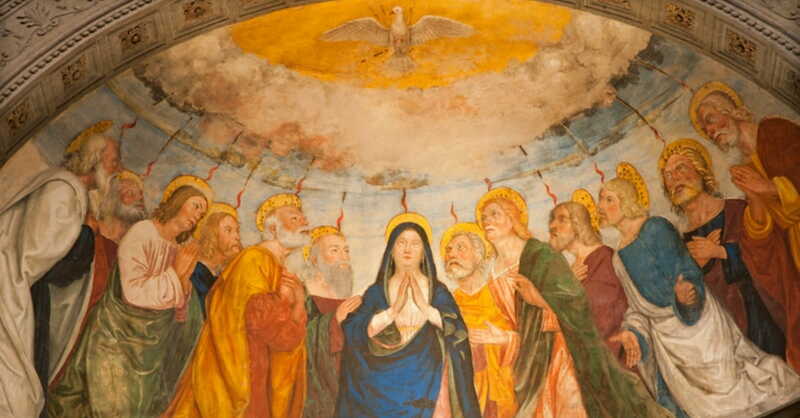 Today, Christians who commemorate Pentecost also celebrate it as the birth of the Church. Some churches celebrate the day with red decorations and some read scripture in a foreign language, but the day should mostly be recognized as the birthday of the church, says Carolyn Arends, the director of education for Christian resource site Renovaré, in an article for Christianity Today. The celebration of Pentecost Sunday and one of its significances is the way that churches all over can unify as “one common church” to say they are “part of the larger story God is telling,” she added. 10. Should Christians also celebrate Shavuot? Does it make sense for Christians to celebrate the biblical festival of Shavuot in addition to (or even in place of) Pentecost? Sharon Sanders, co-director of Christians Friends of Israel, believes so, considering that Shavuot is the version of the holiday actually ordained by God. "I remember well my childhood growing up in a traditional church where we celebrated only Easter and Christmas as set by the historical church. I had no idea God actually established ‘appointed times' for those in His great assembly," Sanders told Travelujah, as quoted by Christian Headlines. "It is unfortunate that many churches overlook the significance of the three main festivals God speaks clearly about in His Word; namely, Passover, Shavuot (Pentecost) and Succot." Today, Sanders lives in Israel and, like many Christians living in the Holy Land, actively participates in celebrating Shavuot with Jewish friends. "I am thrilled to be able to celebrate Shavuot with the Jewish people," said Sanders. "I love celebrating the festivals of God in Israel because more emphasis is put on times of gladness, joy and fellowship with one another rather than commercialism and self-indulgence that so often comes with other festivals. Shavuot for me, as a Christian, is special because the Book of Ruth is read, a beautiful story about God's redemptive love."